Today I would like to share an extremely special Love Story that I received from Beth who is a proud mother of the most beautiful little boy, Keegan. Words can't even begin to describe the strength that Beth and her husband possess as well, baby Keegan. 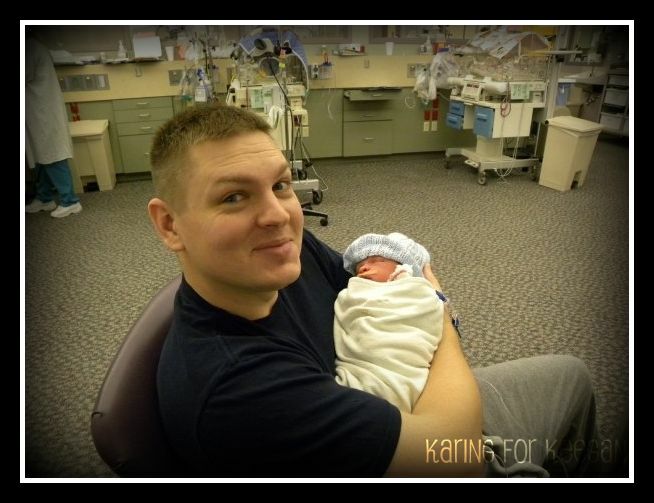 For those who have not had a chance to visit Karing for Keegan I recommend from the bottom of my heart to take some time to visit as well read this amazing story. Love....what is "love"? Is it a feeling, is it an act? Is it a being? Websters online dictionary has 16 definitions under the noun category for love. I personally like #10-Affection; kind feeling; friendship; strong liking or desire; fondness; good will; -- opposed to hate; often with of and an object. We LOVE all sorts of things in life; our spouses, our children, our pets, different places, food, rainy days where we curl up in bed and watch movies, etc. 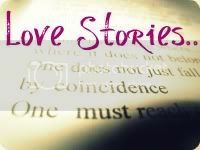 My love story involves my son, Keegan Thomas. Our story didn't begin like most "love stories" and really isn't like most other love stories, you see Keegan is very special. March 2009 I found out I was pregnant with our first child. Oddly enough we conceived on or around February 14th (you know the Hallmark holiday of love). My pregnancy was not what I considered normal but then again it was my first and really didn't know what to expect. I had read all these books and heard people talking on one of my favorite message boards about how they were so attached to their unborn child and already loved them without knowing them. I can't tell you that I felt that exact way, you see, I don't think I was really attached until the last trimester. Weird? Maybe, but I am a worry wart by nature and constantly worried something would happen to him. As luck would have it, I started to get severe signs of pre-eclampsia at 32 weeks. I went on bed rest, spent a couple of nights in the triage of our local women's hospital but was put on blood pressure meds and told to take it easy. Around 34 weeks 2 days my liver enzymes had gotten too high and my doctor decided to induce, this is where the real love story starts. On September 23, 2009 after 10 hours of labor my "team" of physicians decided my son was NOT coming out vaginally and they were going to have to do a c-section, in their words "his head was too big and stuck on my pelvic bone". (Back note: my son's head had measure anywhere between 2-4 weeks ahead at every ultrasound, and a I had them very frequently.) 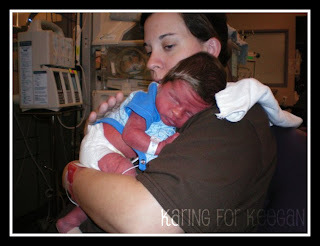 Keeg's was born at 5:43 pm and rushed to the NICU. I wasn't permitted to see him until a little later that evening when they wheeled me in my hospital bed into the NICU to see my son for the first time. This may sound horrible to some, but the first time I saw him I can't tell you that I felt a strong connection. I was still semi drugged and we had been given some odd news before we were escorted to the NICU, our son had an extra digit on each hand and an extra toe on one foot. When I was wheeled into the NICU and at his bedside all I remember doing is staring at his extra digits wondering why he looked that way-I was in shock! I was in the hospital for 4 days all of which were spent going back and forth to the NICU. My love began to grow and I began to know this little human being that I was now 100% responsible for. It was while he was in the NICU for his 2 week stay that our doctors began to notice other "odd" things about Keegan. First and foremost, he was 7 lbs 10.8 oz 6 weeks early and 18 inches long, not your normal preemie. His head was abnormally large and he did indeed have extra digits. They began running tests. Oh did they run tests, first it was simple blood draws and questions for me as to exposures of different chemicals in pregnancy. Then they got a little more serious, CT's, MRI's, EEG's. I was clueless at the time and had NO idea what they were looking for. While he was in the hospital they found he had a stroke in utero and suspected an overgrowth syndrome was responsible for his height, weight, and head size. Upon discharge on October 6, 2009, an appointment with a geneticist was made at Riley Hospital for Children in Indianapolis Indiana. On that blessed day on October 9th, we met with our geneticist whom promptly informed us he had Simpson-Golabi-Behmel (SGBS) an overgrowth syndrome so rare there are believed to be only 130 WORLDWIDE affected by this. SGBS effects primarily males and can cause cancerous tumors in the abdomen. 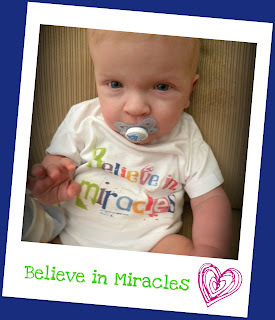 We went home feeling very defeated; yeah we had had a hard pregnancy, delivery, and we knew that there was something "off" other than just his prematurity, but we never dreamed of a genetic syndrome. I loved my baby for who he was, at this point we knew he was special. My husband and our families helped support us to while we learned what was next. 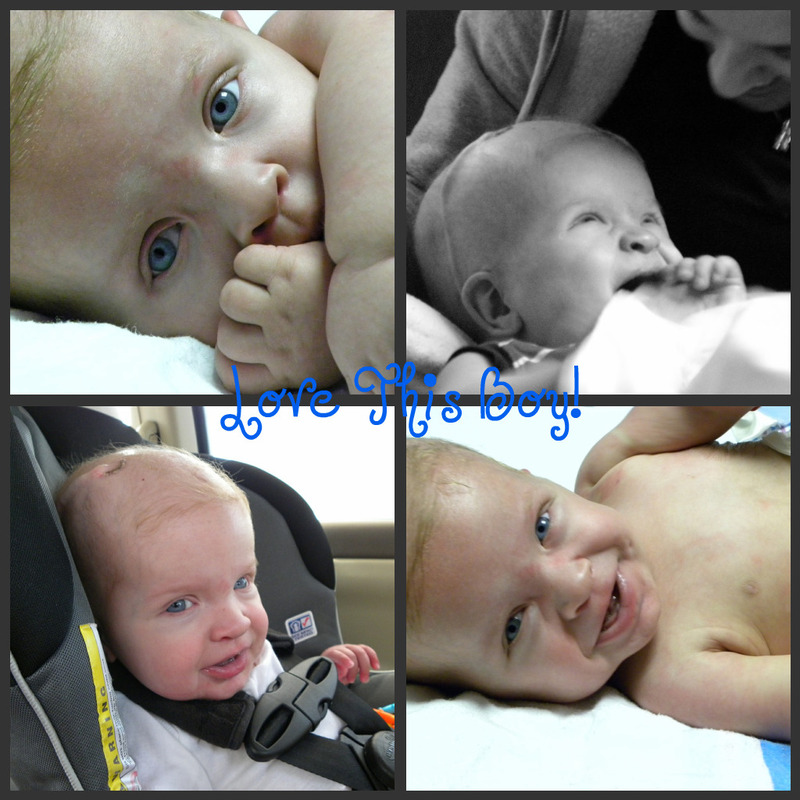 We started Physical therapy because of his prematurity and low tone. Never did we imagine just what was about to be thrown our way. To make what could be a LONG story LONGER I will cut to the chase; Keegan has brain cancer, or Medulloblastoma if you want to be specific. There I said it. Although the terms and percentages associated with this type of cancer still scare the heck out of me, we have come a long way. It all started back in April '10, although this can possibly be traced back to utero, but that is another story for another day. We were sent to Riley for an evaluation because a CT we had done at home showed that there was fluid collecting on Keegan's brain otherwise known as Hydrocephalus. On April 15th we had our first brain surgery to install a shunt to drain the excess fluid. We went back to see our Neurosurgeon for a 2 week follow up after surgery and got the all clear "see you in 6 months". This is where our lives started to spiral out of control and far beyond anything we could EVER fathom. Shortly after this appointment, he started to act kind of funny. He all of a sudden had "asthma" type symptoms and then the projectile vomiting began and multiple trips to the Emergency Room. The first trip he was diagnosed with the flu and I quote from the nurse: "because we couldn't find anything else wrong, we just tell people that." Take him home, try Pedialyte for the rest of the night and start the B.R.A.T method tomorrow. Did that. Vomiting continued incessantly. He eventually stopped eating so I took him BACK to the same ER and demanded something else be done. On May 8th in the late hours, he was diagnosed with a bowel obstruction. They got a hold of our neurosurgeon in Indy and we were whisked away via Life Flight to Indy on my very first Mother's Day. Once in Indy it took a couple of days for the doctors to finally get the brilliant idea to do an MRI. On Tuesday May 11th around 7pm I got handed THE. WORST. NEWS a parent could ever receive. 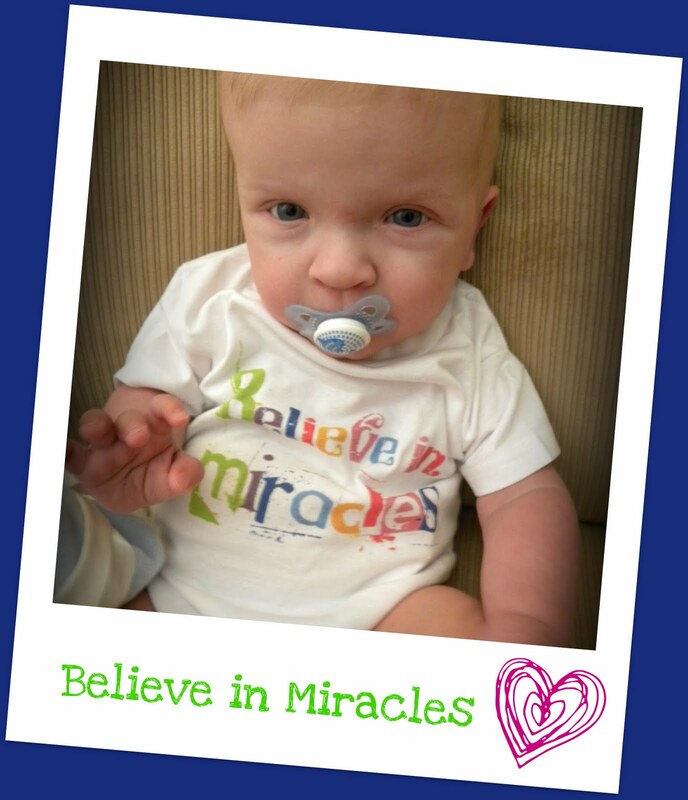 My son, 7 1/2 months old at the time, had a large mass that had grown SO BIG that it was putting pressure on his brain stem and pushing his cerebellum up into the rest of his brain. His body, in essence, was shutting down, there was just no more room and the shunt was doing all it could to just alleviate the pressure. Since then we have tried to make the absolute best out of the horrible situation we have been dealt. I think we value each day, love him that much more, and each milestone is a little more special knowing that even though our son's primary tumor was removed back in May, Keegan is still fighting the fight of his life and doing it like a champ. At the End of July we did an MRI to see how his brain and spine were reacting to the most intense chemo possible. I remember thinking it's no big deal, just another scan, it will be fine. To my dismay, shortly after Keegan was brought back to his hospital room a social worker came and got me and asked me to join her, our oncologist and a nurse in the conference room. Our oncologist proceeded to tell me (my husband was on his way to Indy from Evansville) that the tumor had grown back and it was now about half the size of what it was when it was resected in May. We ALL sat there dumbfounded-how in the world could this tumor grow back through the worst, the most intense, the most damaging chemo a child can get? All I remember thinking and saying was "omigod, okay, omigod okay." ::: Surgery-We could go in and try to remove this "tumor" but as shown it will just grow back again and why put Keegan through another crainotomy and the recovery with much higher risk of infection? Focal radiation- This radiation would be a beam directed to the specific tumor and try to kill off a lot of those tumorous cells. ::: Clinical Trials-We could look into clinical trials at any of the larger children's hospitals throughout the country that participate in them. I asked him to look into trials and second opinions at CHOP-Children's Hospital of Philadelphia, St. Jude, and Boston's Children Hospital. The only option that even seemed viable for us was focal radiation done out of Bloomington Indiana (2 hours from home). This would help shrink the tumor and give us more time while we planned beach vacations, family pictures and just took to the time to love on our precious baby. My only problem with this option was that my husband and I found ourselves wondering well "what if its not tumor and we radiate regular brain?" We posed this to the oncologist and our neurosurgeon. They had been trying to think of ways to test what was there without going into surgery as well. In fact they both admitted to us that they were kept awake many a night thinking about our situation and what to do. On Tuesday August 17th we drove up to Riley for the best solution possible to "double check" that it was for sure tumor and not regular brain. He was sedated and taken for a 3 hour long MRI that was comprised of many different types of scans. We drove home knowing we wouldn't hear anything right away. On Wednesday the 18th at around 8 I received a phone call. It was our neurosurgeon, what they thought was tumor in fact WAS NOT tumor and was either contused brain or old dead tumor. These were the words I was longing to hear, these were the words I had been praying for for weeks, these were the words we deserved to hear! The doctors were wrong the tumor had not grown back and he was not on his death bed! Shortly after she called our oncologist called to tell me more of the specifics. He said he was getting ahold of the radiation facility and canceling our future radiation scheduled to start 2 weeks later and we were to come back up to Riley the next day to get Round 4 of his chemo started back up! I couldn't have been more happy! October 18, 2010 Keegan was admited to the Stem Cell unit at Riley. He got 6 days of very intense chemo, so intense that he then had to have a stem cell transplant (seen here ). We are now on isolation for 6 months to a year while his immune system recooperates. We have our 8 week follow up MRI on February 8th. We are asking people who follow our story or want to support us to wear green. You can take a picture of yourself with your green on and post it to Karing for Keegan on Facebook. MRI's make me nervous, very nervous to be honest with you. I have already started taking my anti-anxiety pills in anticipation of the day and all it holds. He is our little fighter, our oncologist told me that he is pretty sure he should not have made it out of the first trimester because of all his genetic abnormalities. We are still pretty far behind developmentally. We are working hard every day though, hopefully soon he will be able to crawl and eventually stand and progress to walking. I am not pushing anything, we don't take any time for granted but know that Keegan will develop and flourish in his own time. He is the love of our lives and even though he is not like other babies, he is our baby and we love him more than life itself.